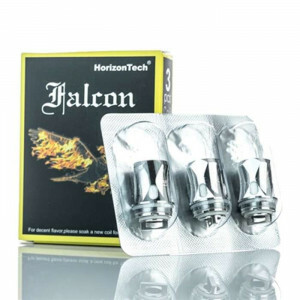 The Horizon Falcon Resin Artisan Edition Sub-Ohm Tank is a truly exceptional vape tank that has a luxurious appearance and impressive technology. Designed to give you the tastiest, thickest vape clouds imaginable, thanks to an impressive airflow design, this tank satisfies in every way. The top cap design of the convex glass piece that comes with this tank allows vapers to enjoy up to 7mL of juice before it's time to refill.The built-in Horizon Falcon M-Triple Mesh Coil system that’s packed with 100% organic cotton within a stainless-steel frame improves the taste of your e-juice while producing thick, luxurious fog.The Horizon Falcon Resin Artisan Edition Sub-Ohm Tank is a uniquely impressive vape tank that's gorgeous to look at and designed to satisfy.